A go! 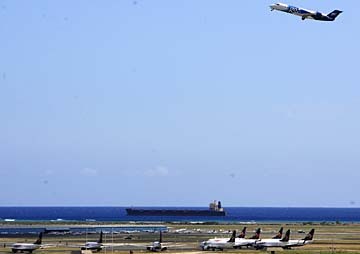 plane took off over the fleet of now-inactive Aloha Airlines 737s at Honolulu Airport yesterday, the first day after Aloha Airlines' sudden shutdown left 1,900 employees jobless, many passengers stranded and a community shocked. When Aloha Airlines folded, stranded passenger Deana Jacoby and her husband, residents of Redding, Calif., put their chips on a flight to Las Vegas. They lost the standby shuffle. Their luggage won. So today she flies to Sacramento, Calif., on United Airlines while her husband flies to Sin City to claim their belongings. Such were the laments yesterday in the aftermath of Aloha's precipitous collapse. By day's end, nearly all out-of-luck ticket holders had won a seat home as the remaining isle airlines adjusted their routes, capacity and work force to keep air traffic flowing smoothly. Merrie Monarch Festival dancers Kanoe Elvenia, foreground, Bella Trinidad and Jenni Trinidad readied to board a Hilo flight yesterday. "I have to say that it's very sad, but it's not such a hardship for us," said Shelsea Apana, who handled Merrie Monarch travel arrangements for Halau Hula Olana. "Our stress cannot even compare with the workers who lost their jobs, their retirement." The company's cargo pilots, meanwhile, threatened to walk off the job in a dispute over seniority flying rights, prompting the airlines to ask for a temporary restraining order against its pilots union and local unit chairman. Hawaiian Airlines took over a few of Aloha Airlines' gates at Honolulu Airport yesterday to serve passengers. 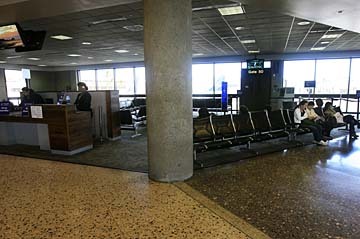 The Aloha side of the terminal -- once abuzz with hundreds of daily passengers -- was a virtual ghost town the day after the shutdown. Aloha Airlines filed for a temporary restraining order against its pilots union and its local unit chairman yesterday after claiming that the company's cargo pilots threatened to walk off the job over a dispute regarding seniority flying rights. The showdown between the Air Line Pilots Association and the now-bankrupt company prompted Aloha's lender, General Motors Acceptance Corp., to back off on its promise to provide up to $3 million in financing so that the company could auction off its profitable cargo business. Instead, GMAC said in federal Bankruptcy Court yesterday that it only would provide cash collateral of about $900,000 to cover Aloha's operations through Friday, and that it wouldn't provide any additional money unless the pilot issue was resolved. The courtroom fireworks over the cargo unit -- one day after the company shut down its passenger operations -- not only could jeopardize the sale of that unit but could affect the state's economy. Aloha flies 85 percent of the state's cargo; it also handles all U.S. Mail service to Maui and the Big Island. An ALPA negotiator said later that the union authorized no such walkout and that it merely wants the company to adhere to the collective-bargaining agreement. "For the company to file that TRO was irresponsible and inappropriate," said pilot John Riddel, a member of the union's negotiating committee. "As Mr. (David) Banmiller, our CEO, said so eloquently in the courthouse today, the spirit of cooperation with ALPA he's had in his extensive airline career has been unlike any other group he's ever worked with." Aloha told Bankruptcy Judge Lloyd King it was at risk of losing the one confirmed offer it has for its cargo division if the auction process is delayed for any significant length of time. Seattle-based Saltchuk Resources Inc., which has offered to buy the unit for $13 million, and GMAC both agreed yesterday to extend the auction process by one week until April 24 to allow for more bidders. Van Nuys, Calif.-based Castle & Cooke Aviation, led by Dole Food Co. CEO David Murdock, is interested in bidding for the cargo unit, while Kahala Capital -- which includes current Aloha minority investor and board member Richard Ing -- is interested in buying the cargo unit as well as the airline's aviation services unit and certain intellectual property, including the Aloha name. But things could unravel without an agreement between the company and the pilots union. "It's out of my control," GMAC attorney Douglas Lipke said. "We'll wait to see what happens on Friday." A status conference has been scheduled for tomorrow morning to update the judge on the pilot issue and to take care of other unfinished matters, such as the disposition of the aircraft leases. Banmiller said late yesterday afternoon that all of the cargo flights up to that point had gone off as scheduled, that he anticipated no cessation or disruption of service, and that the company was working with ALPA to resolve its disputes. Under the ALPA contract, pilots bid for flights based on seniority, and there are now only about 25 to 30 cargo pilots remaining out of a total of about 250 pilots at the airline. The end result is that some pilots with fewer years of experience are still employed because they're in the cargo division while senior pilots who flew passenger aircraft are now out of work. In its motion, Aloha said ALPA apparently takes the position that cargo flights should be granted to pilots based solely on seniority without taking into account those pilots' qualifications to fly Aloha's cargo service. The filing said ALPA told Aloha that if the airline didn't agree to certain union proposals that it would not encourage pilots to fly the cargo routes, and referred to those who would as "scabs." In the motion, Aloha included a communication from ALPA's local unit chairman, David Bird, to Aloha's pilots which read, in part, that the company "foolishly think(s) they can just operate cargo status quo regardless of seniority." ALPA put out a press release late yesterday in which it said that local pilot leadership has urged pilots to continue to report to duty for cargo flight assignments. Riddel acknowledged after the court hearing that he has "no idea" what the pilots will do, but added that "they've been instructed from day one to be professional, to maintain the superior safety record that we have, and to do their jobs."